Would you like to loose weight? Have more energy so you can think clearer? Have better sleep? Work out more efficiently? Feel balanced in your mood? All of these things are possible if we begin to engage with our daily habits during the hours that the body is naturally inclined to practice them. 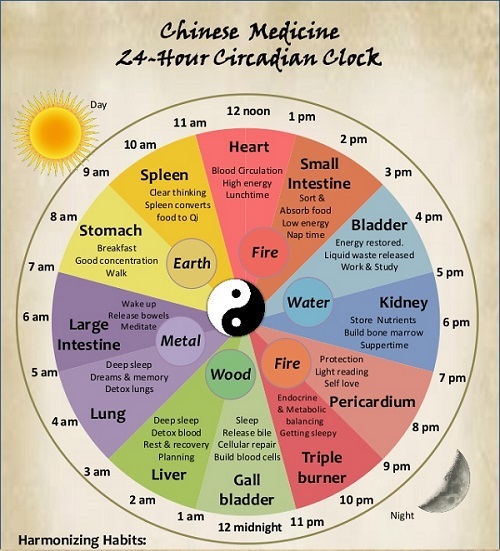 We can discover this timing from the ancient Chinese medicine Biological Clock. We are creatures of habit. This means that are bodies are built to operate habitually. We are designed according to a circadian rhythm that operates over a 24 hour period. Its a law of nature and the science behind this phenomenon was most recently awarded the Noble Prize in physiology and medicine. The Chinese discovered this chronobiology long ago and actually spelled it out for us quite nicely. As you can see in the mapped out chart, a lot of us may begin our day during the large Intestines time between 5-7 am. This would be the body’s most ideal time to go to the bathroom followed by the stomach hours of 7-9 am, when we are most inclined to eat breakfast; the stomach during these hours knows to assimilate the food we eat, followed by the spleen hours 9-11am. This Chinese spleen organ system is the best time of the day to use our brain and our muscles, so either a high amount of comprehension and memorization or one of the best times to exercise and lose weight while doing so. In western medicine, they discovered that we have a cortisol rush at 8:00 am; this is our stress hormone that allows us to manage a lot of mental and physical stressors we subject ourselves to. Right after this is the heart hours of 11am- 1pm, when the blood is circulating the most, the body is the warmest, and the sun is at its peak being the most yang time of day. Moving into some of the evening hours, between 5-7 pm is the time of the kidneys; this means your reproductive essence and fertility is at its highest and would be a great time to engage in conceiving a child. Being asleep between the gall bladder and liver hours of 11pm- 3 am is so incredibly ideal for our cellular repair, blood detoxification. The hun, or etherial soul, is associated with the liver and is considered to be our consciousness. If we are in deep sleep during 1-3 am, our hun can return to its resting place in the liver, allowing for an easier mood, less stress, and living consciously during the day. Also being asleep during the lung hours of 3-5 am is wonderful for detoxing and cleaning out our lungs while we sleep. This is also when our immune systems are doing their best repair. You might notice if you have a certain weakness or issue with a particular organ system, you are more likely to see symptoms during that time of day on the biological clock. If you do notice repeated symptoms on an almost daily basis at the same time each day, tell your acupuncturist. This is very useful information for your practitioner to know, so he or she may better treat you.